Hollyhocks are a garden favorite often found in cottage gardens or growing along fences or buildings. The showy flowers on stalks that can reach a height of about nine feet make this a good choice for a natural privacy screen or to block the view of an unsightly shed or fence. The height of hollyhocks also makes them a good choice for the back of borders or the center of island flowerbeds. Since hollyhocks are known to attract pollinators, be sure to consider these beautiful blooms if you are planning a butterfly garden or want to support local bee communities. Depending on the variety you choose, hollyhocks mainly bloom throughout summer or from mid-summer to early fall. Hollyhock is considered a biennial, which means the plant starts by growing foliage the first year, and then flowering and going to seed the second year. However, it can be grown as a perennial, and its self-sowing nature can keep you flush with hollyhocks for years to come. Hollyhocks can be planted in the spring or fall. If you live in an area where winter freezes are common, it is best to plant in spring. If frost and freezes are not an issue where you live, you can plant in the fall, which could reward you with first-year blooms after the seeds sprout in spring. Choose a spot in your garden that gets full sun and is protected from the wind. Hollyhocks prefer well-draining soil. So, if you are working with a heavier soil, work compost into the soil to improve drainage before planting. You can plant hollyhocks from seeds or seedlings. 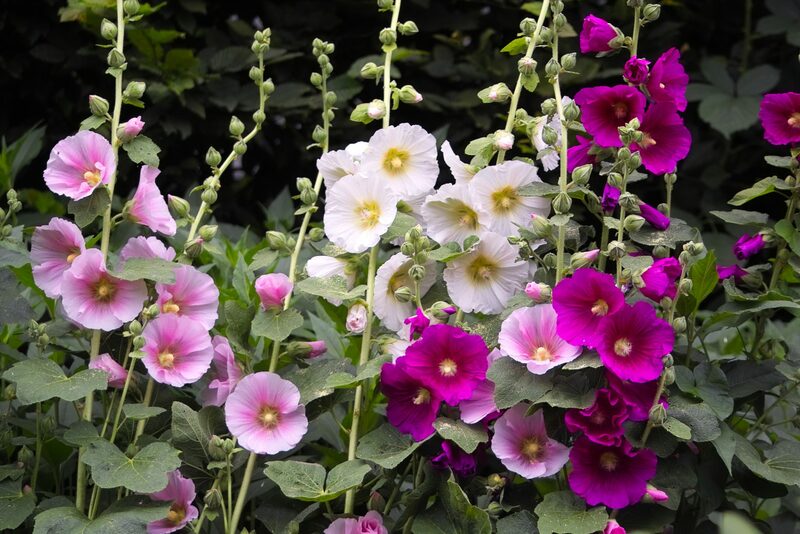 If you choose to plant hollyhocks from seeds, sow the seeds just below the surface of the soil about 18 inches apart. It is best to water the soil before sowing the seeds to avoid washing them away or having them shift positions before germination. You can also start seeds in seed pots or a seed tray indoors to later transplant into your garden around the last frost in spring. If you prefer planting hollyhocks from seedlings, wait until a few weeks after the last frost, and then plant them 18 to 24 inches apart in your flowerbed. Hollyhocks are self-sowing and will drop seeds during the blooming period that will germinate and grow, so, once you establish your hollyhocks, you can expect to continue to get new plants. This also means that your hollyhocks will creep into other areas of your garden, but you can transplant these seedlings to control the spread of your hollyhock population and to fill in open spots where tall plants are needed. 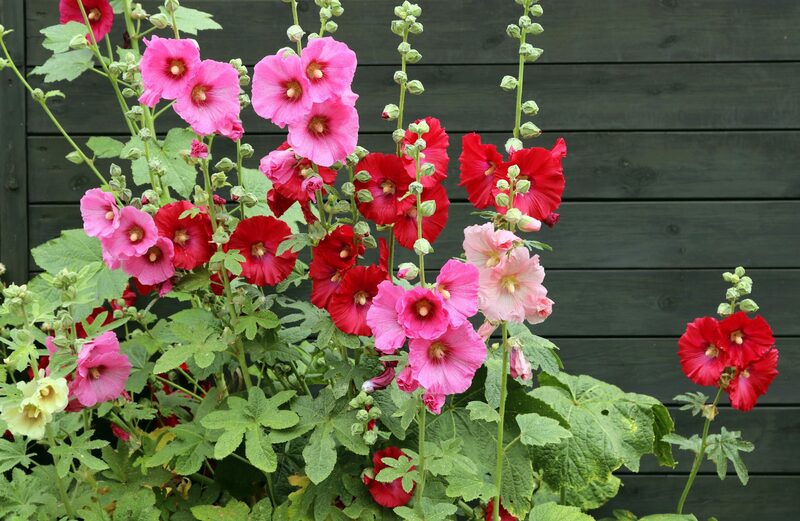 Hollyhocks require regular watering until established and during hot, dry weather. They are drought tolerant, but you will see better blooms with more water. You will also have showier blooms if you fertilize your plants about once a month. To keep your plants healthier and extend their lifespan, deadhead flowers as they fade. At the end of the blooming season when the flowers fade, cut your hollyhocks back to just a few inches above the grown. Spread a little compost around the base of the remaining stalks after pruning. Be sure not to cover the stalks with the compost or to place a thick layer of compost right against the stalks, since this can cause moisture retention around the stems that can rot them. Hollyhocks are susceptible to rust, which is a fungus that can be spread through water or the air. Keep your eye out for small spots on the leaves and remove any leaves that have these spots as soon as possible. This will help prevent the spread of spores to other leaves or nearby plants. Should I Grow Vegetables and Fruit in a Drought?